We’d love your help. Let us know what’s wrong with this preview of Math Girls by Hiroshi Yuki. Math isn’t hard. Love is. Currently in its eighteenth printing in Japan, this best-selling novel is available in English at last. Combining mathematical rigor with light romance, Math Girls is a unique introduction to advanced mathematics, delivered through the eyes of three students as they learn to deal with problems seldom found in textbooks. Math Girls has something for Math isn’t hard. Love is. To ask other readers questions about Math Girls, please sign up. Hi: Can anyone who's read this book comment on the reading level? I have a daughter who is heading into 7th grade; she reads well above level but struggles a bit in math. I've been looking for a decent math book catered to middle/high school girls. I'm a woman and a math major, and there really aren't that many of us out there. I skimmed through Danica McKellar's book and was insulted; pretty much all of the examples centered around the kind of calculations necessary for shopping (calculating sales tax, etc). I'm not exactly sure what I was looking for, but that wasn't it. However, Math Girls is more than I could have hoped for. The mathematics that it covers is a I've been looking for a decent math book catered to middle/high school girls. I'm a woman and a math major, and there really aren't that many of us out there. I skimmed through Danica McKellar's book and was insulted; pretty much all of the examples centered around the kind of calculations necessary for shopping (calculating sales tax, etc). I'm not exactly sure what I was looking for, but that wasn't it. However, Math Girls is more than I could have hoped for. The mathematics that it covers is actually quite deep (it gives a light introduction to the Riemann-Zeta function and generating functions), and the explanations are clear and elegant. Though pretty simplistic, I liked the story-line, which had the main character (a boy in high school) dealing with his attraction towards two different girls. The fact that he likes both women -- the novice who is interested in expanding her knowledge even though she feels inadequate, and the math prodigy who is miles ahead of the main character -- sends the perfect message to young girls interested in mathematics. You don't have to dumb yourself down to be liked, and on the flip side you shouldn't feel like you're not good enough at math to do some exploration on your own. Everyone thought I was crazy for reading a book about math that wasn't required by school, but something about this book called out to me. I mean, up until now, I've had a strange relationship with math. In elementary school I hated it, and then in high school it changed. I started liking math and to this day, I really love it. Now in Grade 12 Calculus, I picked up this book and realized just how much I don't actually know. They would start with something simple that you even learn in grade 10 functions. For example, they would start with arithmetic sequences or binomial expansion and then they would just run with it. They would take it so much farther than what we do at school that I would feel kind of ashamed. Here I thought I was good at math, but there is so much more out there. I liked seeing that new math. I like it a lot. It changed my approach to how I solve math problems especially series and sequences. The story really took a backseat here for me. The math problems were more interesting. The only thing I would have liked from the story is (view spoiler)[ I wish the main character would have chosen one of the girls or at least told us which one he ended up with. I was waiting for him to choose one of them, but the epilogue was so open. It seems like he kept in touch with both of them (hide spoiler)]. I would say that if you like math and a sweet friendship, then you'll like Math Girls. Although I’m studying Mathematics at the university, this book taught me a lot, even more than the classes I had. I really enjoyed the combination of the love story with Math, and I also learned a lot from the main characters. Their personalities, thoughts and the way they look at Mathematics are really interesting. Math Girls is written in a way that you can understand the demonstrations, examples and problems. After reading this book, you will fall in love with Maths. In my case, I fel Amazing!! After reading this book, you will fall in love with Maths. In my case, I fell in love with Maths again. This is an interesting book, it covers a large amount of content, mainly from number theory and enumeration. The romance was very light and fluffy, and was definitely good to break up the content, because without it it probably would have been rather dense, though it is a bit dense still. Covers topics like Catalan paths, convergent and divergent sequences, the zeta function, formal power series and generating functions. This is a beautiful book - highly, highly recommended. Math Girls captures the nature of inquiry and the process of learning and does it all whilst creating a beautiful story. A captivating read. I loved the concept of this book, it really made me see the beauty in Math. I really enjoyed this book. It reminded me of Sophie's World in many respects and had a nice, simple storyline. However, it didn't insult the readers intelligence and gave a clear exposition of some interesting mathematics. Original idea, good implementation: not just the typical Japanese high school love story. Gentle, romantic atmosphere, intellectually stimulating and lovely characters. I really appreciated the drawing style. This book is amazing. It gives the reader tools to solve all sorts of problems and really makes you think. I'll probably have to read this again a few more times to get everything out of it that I can. This is a book that has let me find my passion for math. If it was not for this book, I would be studying physics right now! Lots of math with just enough story to keep it all together. It was fun to get back into some of that type of math after graduating several years ago and not dealing much with math anymore. Couldn't finish it, it was so boring and the math completely beyond me. But, the story was also poor. Math Girls is not Hiroshi Yuki’s first book about the sciences, as he has written others on niche topics such as Java and Perl. Math Girls focuses on the often unseen beauty of mathematics and the enjoyment one can get out of studying difficult problems and working on their proofs with friends. Yuki melds young adult fiction with a mathematics textbook in this novel. The book centers around the relationship between three seemingly incongruent characters. The first is the unnamed narrator, a shy Math Girls is not Hiroshi Yuki’s first book about the sciences, as he has written others on niche topics such as Java and Perl. Math Girls focuses on the often unseen beauty of mathematics and the enjoyment one can get out of studying difficult problems and working on their proofs with friends. Yuki melds young adult fiction with a mathematics textbook in this novel. The book centers around the relationship between three seemingly incongruent characters. The first is the unnamed narrator, a shy boy who would rather sit in the library and work on math problems than socialize. The first female to whom we are introduced is the fierce and math-hungry Miruka. She is not only the love interest of the narrator, but also the instigator of the more difficult math theories. Her problems may be more preferred to those dealing with higher levels of math. The final main character is Tetra. She develops a crush on the narrator after she has asked him to be her tutor. Yuki thoroughly delves into Fibonacci Numbers, Harmonic Numbers, Finite and Infinite Sums, Factorization, the Basel Problem, Partitions of an Integer, and Generating Functions. While the narrator works with Tetra, the reader watches as the basics of math are very slowly and intricately explained. However, as soon as Miruka enters the scene, the math difficulty escalates and is much more laborious to follow. This book would certainly be more challenging for those who are just beginning calculus. If I were to recommend this to a high school student, I would recommend that (s)he really focus on the dialogue and problems discussed between Tetra and the narrator and then to try and follow Miruka’s explanations, but to not worry if they struggle to understand. The non-mathematical storyline is sparse, but it is also not the focus of the book. The unassuming narrator struggles with the attention he receives from both Miruka and Tetra. He does not understand Miruka’s aggressiveness until he sees it through the eyes of Tetra. He also fails to pick up on Tetra’s crush until she accidentally admits to loving him, twice. Although some have complained of the slow progression of his relationship with these ladies, there is one scene in the library where Miruka does not mask her feelings with intensive mathetmatical proofs. Furthermore, the epilogue cleanly sums up the future relationships he will have with these two women. Despite the inching romantic plotline, this book truly does provide a marvelous alternative to the explanations one may find in a math textbook. Tetra asks numerous questions that are probably heard by math teachers on a regular basis. Through the narrator’s patience and eloquence, confusing math terminology is broken down in a way that is easily understandable. The author also presents us with characters that are, for the most part, likeable. Many students may not go above-and-beyond their homework or what they learn in class for fear of their social status. However, these three become close friends who share a mutual respect and interest in this subject. Mathematics can sometimes be seen as a lonely affair, but Yuki presents it in a social context. He provides proofs that utilize teamwork and discussion to complete. This book can be incredibly helpful to teachers, those who have an interest in math, or someone who is looking for a different way to explain a mathematical problem. 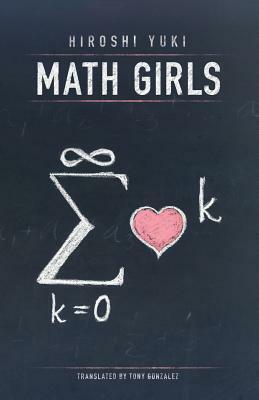 Math Girls is an exhilarating journey through high school and advanced mathematics. Narrated by an unnamed male character with a passion for math, the reader is captivated by the correlation of the relationships between characters and the flow of math concepts. He is joined in his passion for math by Miruka, a fellow student who has her own style of solving mathematics, and Tetra, a younger student with a growing passion for the world of math. Miruka takes the role as a tutor and friend figure Math Girls is an exhilarating journey through high school and advanced mathematics. Narrated by an unnamed male character with a passion for math, the reader is captivated by the correlation of the relationships between characters and the flow of math concepts. He is joined in his passion for math by Miruka, a fellow student who has her own style of solving mathematics, and Tetra, a younger student with a growing passion for the world of math. Miruka takes the role as a tutor and friend figure to the narrator, while our narrator takes that role to Tetra. It is not until the end of the book that these two separate relationships with the narrator come together and these three students begin to explore the world of math together. Caught between two beautiful girls, the narrator sees not only their beauty, but the beauty that encompasses mathematics. The math concepts that are discussed in this book include: sequences, patterns, generating functions, geometric means, harmonic numbers, Taylor series, the Basel problem, partitions, and much more. While most books that involve math are dry and hard to follow, Math Girls is not a typical math text. It does not pick a topic and spit some old proof out for you to follow, instead it shows high school students working through proofs and coming to realizations on their own. For someone who may not know the math covered in a concept, this book does a great job at explaining difficult concepts at a basic level. While the story itself would progress very slowly without the mathematics, it is the shared passion that brings these friends together and keeps the story flowing. Miruka, the narrator, and Tetra are given challenging problems by a teacher, Mr. Muraki. The students then try to solve, or in some cases understand the relation of the problem given to them. Mr. Muraki typically gives them each a different problem that turns out to be related to the problems of the others. So once they teamed up together, as one made and shared the progress of their own problem, it helped the group as a whole. This type of team work is important in mathematics because it not only broadens their knowledge but it also solidifies concepts that they have to explain to one another. As a future educator looking to bring this book into my high school mathematics classroom, I feel that the story flows well and is well written. My only concern is that it would not keep the focus of my students. Reading through difficult math concepts is a bore for those who are not interested in math and quite frankly without the math, there is not much of a story line. The author provides a note to readers that, “If you find yourself faced with math you don’t understand, feel free to skip over it and continue with the story.” If I am using a book to supplement my teaching, I would like my students to actually read it and not just glaze over the only reason that they are reading the story; which is the math. That being said, I would not use this book to supplement my teaching in the classroom but I would have Math Girls available for students to read at their leisure. I absolutely loved this book, unusual as it is. There's a publishing dictum that says that for every equation you include in a book, you decrease your audience by half. That's probably why this book came out in Japan rather than in the West, because it's chock-full of equations, but introduced at a good pace. The plot is simple. The unnamed narrator is a high school boy who loves math. Hiruka is a girl his age but far superior in math; Tetra is younger and not quite as competent but still enthusi I absolutely loved this book, unusual as it is. There's a publishing dictum that says that for every equation you include in a book, you decrease your audience by half. That's probably why this book came out in Japan rather than in the West, because it's chock-full of equations, but introduced at a good pace. The plot is simple. The unnamed narrator is a high school boy who loves math. Hiruka is a girl his age but far superior in math; Tetra is younger and not quite as competent but still enthusiastic about the subject. Through a series of conversations, usually challenges and lectures from Hiruka, and tutoring to Tetra, we learn more about how to think about maths, why we should love maths, and some extremely interesting results in maths that aren't covered by usual high school (or even college) curricula. A light air of romance draws the characters together, but really the romance in this book is reserved for maths. I seriously think that if I'd read this book as a teenager, I would have approached maths differently and understood it a lot deeper than I do now. It's that good. Get it for a math lover in your life! Yay, first book finished in over 6 months! If you're looking to reignite your math passion, this is a great start! Math Girls serves as a historical reference, while introducing several not-so-common series/patterns, and their closed-form expressions. The math contained within would probably be held within 50 pages, so there's not a whole lot of material. Perhaps this is why it was so quick to read. Math Girls was a great read for someone who's gone up through Calculus 2 (either in HS or College) Yay, first book finished in over 6 months! From a mathematical point of view, the book is fun. Non-trivial, quite detailed, carefully explained and sufficiently easy to follow. The topic's mainly calculus and number theory (sequences, series, generating functions, difference calculus etc. ), but the book features a well-devised epistemologic approach, which casts a positive and quite believable light on the process of mathematical discovery. The background narration, though, is extremely dull. The point is not that it's just teenage romanc From a mathematical point of view, the book is fun. Non-trivial, quite detailed, carefully explained and sufficiently easy to follow. The topic's mainly calculus and number theory (sequences, series, generating functions, difference calculus etc. ), but the book features a well-devised epistemologic approach, which casts a positive and quite believable light on the process of mathematical discovery. I really wanted to like this. The math is fairly enjoyable and I learned some new things. But the story... why did they bother? Lame, cheesy and borderline offensive. The main character is a high school student. He likes math. Also, there are two girls. One is even better at math than him and the other is not as good as him and wants him to teach her. But they are both very beautiful and smell good. Nothing happens. My rating says more about me than it does about the book. To my misfortune I understood very little of the math. I hope this doesn't happen to my daughter or future generations of girls. The book is two stories happening simultaneously. It is a story with 3 high school students studying math, one male and two females, and then the math they are studying. I didn't understand either one! Not one GoodReads review yet? Bento Books made the first two chapters available for download via iTunes app if any one is interested. I'll try to tackle this book soon. While I do think that this book did an excellent job integrating the math with the romance, I don't think that the ratio was ideal. Yuki needs to spend more time developing each character, so the math is more interesting to read. I did, however, greatly enjoy the epilogue. First off, I love math. I really really do. If I didn't, I wouldn't be majoring in it. This book was a struggle to get through, though. I found it boring and the plot was too far fetched for me to get into. I just did not like it that much. Subarashii. Truly amusing though you have to be a Math fan to be able to appreciate it. I can't wait for the other books to be translated. Japanese high school students flirt over math homework. The math is not incidental. Much of the book is set using LaTex, and the problems are turned into romantic metaphors. I had to skim over all the math past chapter two. I want to learn more math.